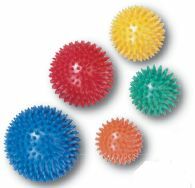 Massage balls and rollers are used to help achieve muscle and tension release for all parts of the body. The "bumpy" textured surface also promotes sensory stimulation and is perfect for manual dexterity exercises. Cando Massage Ball 30-1995, 7 Cm./2.8"
Cando Massage Ball 30-1996, 8 Cm./3.2"
Cando Massage Ball 30-1997, 9 Cm./3.6"
Cando Massage Ball 30-1998, 10 Cm./4"
Cando Massage Ball 30-1999, 15 Cm./6"